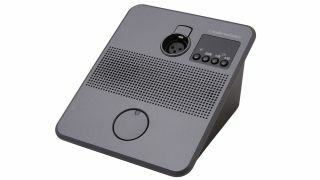 The What: Audio-Technica has extended the functionality of its ATUC-50 Digital Wired Discussion System with the launch of the ATUC-50INT simultaneous interpretation unit. Designed for ease of use in situations where up to three languages are involved, the ATUC-50INT places control in the hands of interpreters, thanks to the system’s web remote-based conference management software application. The What Else: The unit’s control panel is designed for easy selection of headphone volume level as well as the choice of floor or relayed language, and two ATUC-50INTs may be linked to deliver each language for hardware redundancy. Discussion participants can select between the three interpretation channels on their ATUC-50DU discussion units, or the languages can be transferred to an existing wireless language distribution system via the ATUC-50CU control unit. Multi-language discussion recording is also made easier with the ATUC-50CU’s onboard four-channel recorder. The Bottom Line: Building on the ATUC-50’s reputation for speech intelligibility, the ATUC-50INT is designed for bi- and trilingual discussions and applications where cost-effectiveness is an important consideration. The ATUC-50INT is available now.